Have you ever wanted to know if the light is on in the room? Or spent a little too much time looking for something that's dropped onto the floor? Have you encountered an inaccessible website where the screen-reader can't decipher the computer screen? There might be a chance that you've spilt coffee on your tie at work and want to check if you've washed the stain out. You might have your grandmother's recipe book and can't quite make out what notes she's jotted on the side of the page. These are all everyday situations that we find ourselves in and just need that sighted person's quick verification, answer, instruction, or piece of advice so that we can carry on with our days without any fuss or delay. All of these situations can be resolved using your trusty smartphone and the BeSpecular app. Using the BeSpecular app you'll take a photo of what you need assistance with and attach your question via voice note or text message. Your photo plus question will be sent to BeSpecular's awesome community of Sightlings. Within seconds a sightling will receive your message via the app and reply to you using a voice note or text message (we love text-to-speech, don't you?). Once you've received your answer you can rate the service. BeSpecular aims to be quick, simple, reliable, and most of all: friendly. You can download the BeSpecular app free on iOS by clicking here or Android by clicking here. No matter how big or small your question, there will always be someone willing and ready to help. It will be quick and simple for both a VIP and a sighted person to use the BeSpecular app. We 100% encourage you to make suggestions on ways to improve the platform and will always be open for feedback. At BeSpecular we pride ourselves in delivering a quality service to both our VIPs and sighted people. After each interaction you'll be prompted to rate your service and we hope there'll be lots of 5-stars awarded. Ultimately, we aim to make the BeSpecular app your everyday go-to tool as a VIP and a fun way for sighted people to interact with their greater community. Finding out what a picture looks like that was sent to you via Facebook, Whatsapp, SnapChat, etc. Getting more info or details of items when you're doing online shopping via e.g. Amazon, eBay, etc. This article is written by Chris Venter, one of BeSpecular's blind users. The views expressed below are solely his & we at BeSpecular are tremendously grateful for his contribution. The BeSpecular app will be released on the Apple App Store and Google Play Store on July 1st! Since January we’ve been conducting our private beta test with Sightlings and VIPs from around the world. It’s been an incredible 6 month journey of learning, growing and developing. 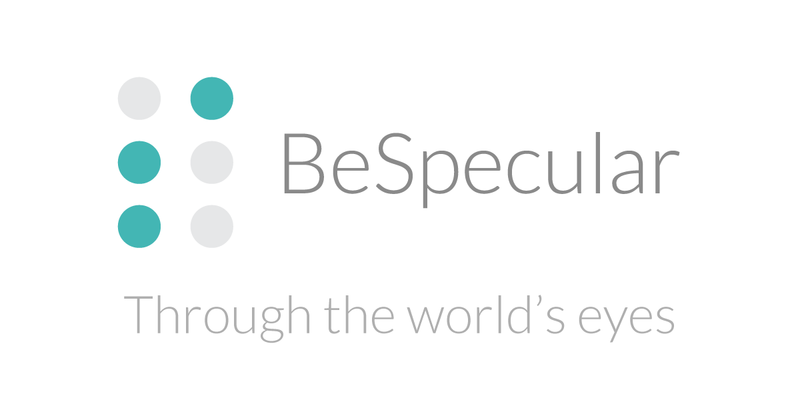 The BeSpecular app is now ready to move into its public beta phase. We’d like to encourage everyone to download the BeSpecular app from July 1st and #ShareYourVision!